No Fenders -Formula 1, IndyCar and A Whole lot more..: AUTOS: A Fleeting Nod to America's Original "Pony Car"
AUTOS: A Fleeting Nod to America's Original "Pony Car"
As always, thanxs solely to Tacoma Bureau Chief Mary Ellen, upon my latest visit "Down south," albeit not the "Deep, Deep, South," nee Arizona; Hya! That 'Awntie Harriet used to question me 'bout regularly... Mary Ellen took me to my Numero Uno Tacoma haunt, America's Car Museum, or simply ACM - which houses many treasures of the vast Harold Le May collection. As a dyed in the wool "FoMoCo" Aficionado, specifically a (Ford) "Mustang Man," Mary Ellen had been promising to take me all summer long to see the museum's Masters of Mustang exhibit which opened Thar' this past mid-June, and will be departing the building's top floor at the end of this coming December, which is almost here; CRIKEYS, MATES! Thus having paid the requisite $5 parking fee and donning our wristbands after having checked in, before we could even begin looking over the exhibit, a term I use loosely, since I cannot S-E-E any of the cars very well anymore, especially as the museum lighting tends to wash out the cars colours... A very friendly ACM volunteer gave us a brief run-down upon the Mustang exhibit we'd come to puruse. Hey, just returned from Le May ACM, i.e. 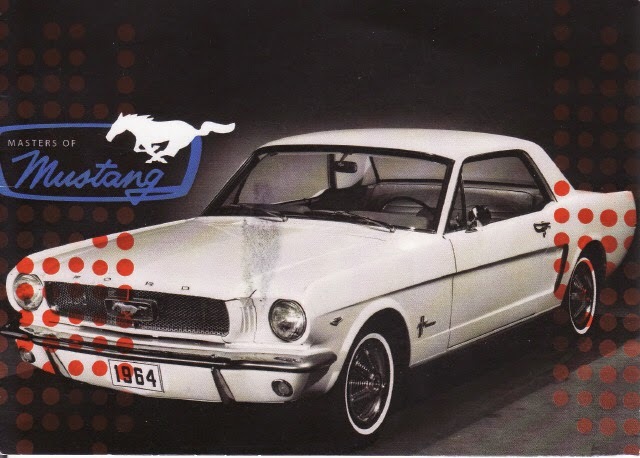 ; America's Car Museum Monday, which has a somewhat "decent" grouping of Mustang's honouring the 50th anniversary exhibit - thru the month of December; with the two most important cars both being 1966 Shelby's, one being a drag car and the other a convertible, both GT-350's. Ah, guess Y'all can teach 'Ol DAWGS' New Tricks after all, eh? As I suppose if I still kept up upon my past knowledge of Shelby-lore, I'd have known this, and hence the female ACM volunteer in Questione was indeed correct! Then there was a lone example of a '71 Mach 1 on display, as I told Mary Ellen that the 1971-73 model years were the longest (wheelbase) body style ever produced, as these chassis were the final hurrah to the "Muscle Years," before something known as the OPEC Oil Embargo forever re-defined not only the Mustang's shape, but much of the automobile industry's as well, as "Downsizing" became Avant Guard. Then a lone 1992 'Stang, black I believe, to which I don't recall Mary Ellen's exact disparaging remark, although basically comparing it to a cartoon, albeit the 5.0-liter era was the start of the Mustang's resurgence performance-wise, as the fourth generation (1979-93) Fox platform Five-point-Oh liter cars definitely made Mustangs popular again. A solitary 5.0 "Police Interceptor," aka police car sat on display, to which Mary Ellen mused she didn't know that they'd made Mustang police cars. To which I was well aware of, and think they were also made in the 1990's. As I seem to recall they were used by the CHP, i.e. ; California Highway Patrol, made forever famous in "CHiP's." A relatively stock '67 GTA awaited us next alongside the Police Interceptor, to which I showed off some of my remaining Mustang knowledge by pronouncing that GTA stood for GT Automatic. Although the Bullitt "clone" next to the GTA should have been parked alongside the Police Interceptor for humour's sake, as police car vs. BAD ARSE Hombre Steve McQueen; Oh Never Mind! As the Bullitt example was nicely done and even featured its passenger side visor autographed by McQueen's first wife, Actress Neile Adams. Amid the flotilla of 'Stangs, sat the three most valuable chassis on display, with the exhibits two heaviest "Hitters" being the 1966 Shelby GT-350 convertible previously mentioned above, along with another unknown "Gem" to Mwah, a factory '66 Shelby GT-350 Drag Car! to which I believe there were also four of these produced? As both cars are owned by the same local private owner, who I'm told has quite the collection 'O cars! Although I have ridden in an ultra-rare 1-of-50 blue with gold stripes automatic Hertz Shelby's on multiple occasions; even having been so fortunate as to drive I-T once! Profile of the 1966 Shelby GT-350 Hertz "Rent-a-Racer"
And on the heels of all of my renewed Attenzione upon Mustangs & Shelby's, was totally caught off guard by the announcement that Ford has unveiled its brand new version of the Shelby GT-350! Another mystery was presented to Mwah by Mary Ellen, when she inquired what does AC Cars stand for? As 'Ol Shel (Carroll Shelby) sold the name Cobra to Ford in 1965, who were keen to capitalize upon the name's marketability, having long since blurred the lines between the AC Cobra, Cobra Mustangs and even Cobra Jet engines! BUUUUZZZZZZZZZZZZZZZZZZZZZZZZZZZZ!!!!!!!!!! Put 'Dem No. 2 Pencils Down; Times UP! AC Cars Ltd was originally known as Auto Carrier limited in 1911, albeit its initial name was Auto Cars and Accessories when first formed in 1903 when producing 3-wheeler vehicles. Then with the advent of a new partner, the company was rebranded as AC Cars Ltd in 1922... And the rest, as they say, is history!